I had to take my new-to-me minivan in for an oil change. 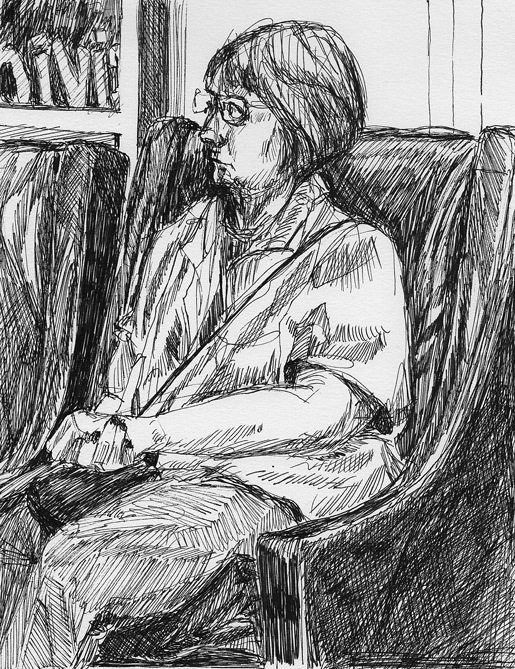 While I waiting in the service waiting area, I drew this woman who was also waiting. She was quite still. There was a television on and she was watching pretty intently. I got her image very close to finished before her car was ready for her. You can see the lettering on the windows of the dealership on the upper left. This is not finished. I still have to correct the shape of the pot and I intend to change the color of the background. The reflections need some refining as well. I swore I wouldn’t do another self-portrait but here I am in my green t-shirt as a reflection in this teapot. I guess it’s a stealth self-portrait. Reflective surfaces are not as difficult as most people presume them to be. They just reflect what is around them in a distorted way. The distortion makes it easier to lie and still communicate the reflective quality of the object. By placing the striped cloth under the pot the pattern becomes an aid to seeing the distorted reflected shapes including my own. I did a little further research into Betty Edwards’ theoretical premises on right brain/left brain function and she is on the right track. Actually the ancient Greeks got it too. They said, ” People are of two minds. One perceives the other understands.” The left brain is a filing cabinet collecting the disjointed information it perceives. The right brain is more holistic providing a context for explaining the information. The right brain allows you to get a joke and to interpret the visual field. It allows for non-verbal, visual thinking. This painting has a peculiar history similar to that of this painting. This image is the third incarnation. It started out very well with a white ladder backed chair in front of the sitter. Having to peek through the openings of the chair was interesting visually and spatially. But I couldn’t come to the second session to finish. It would never have been completed. The following session, with a new pose, was for one time only. So I decided to paint over the previous figure. I tried to merge aspects of the previous figure into the new image and create a composite abstraction. It was not successful. I think that’s a venture requiring many drawings and paintings to master. So this horizontally oriented image is on top of that second, vertically oriented painting. I saved the striped pattern above this model’s shoulders from the second painting. I then invented it in the other places where the stripes continue on the left and where the stripes appear as a fragment at the lower right. Someone made the commented that she was unadorned. I thought she was adorned quite well just as she was. But I also thought, since I am such a freak for pattern and color, that the adornment should surround her. She would luxuriate in pattern and color while remaining unadorned herself. So I included the patterns of the fabrics upon which she sat and added a second layer of loosely painted stripes horizontally, behind the ochre and green stripes, at her shoulder level. I am very pleased with this painting. There is a floating quality and at the same time she seems firmly anchored in a believable space. This is in spite of the fact that I am constantly nudging my students not to present me with floating figures! I substituted for a colleague a couple of weeks ago and this young man came to model for us the very first time. I mean the very first time for him. I gave him a few suggestions on what to do. 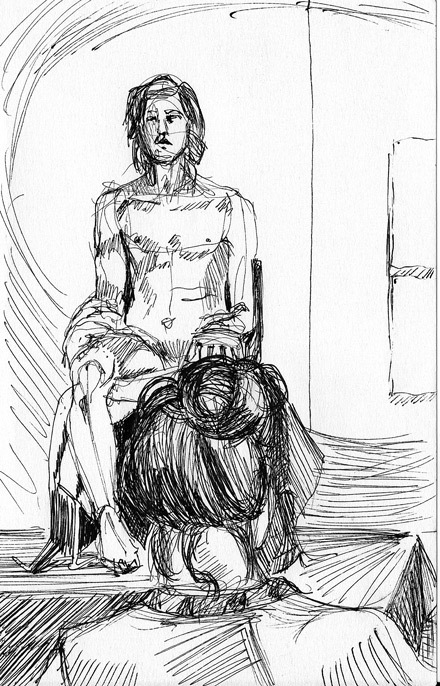 Life drawing models have to have a lot moves in their repertoire. Beginners must do lots of quick gestures; at least 3 per minute. It’s the only way for a student to get out of one’s own way. By forcing fast work one cannot second guess her/his first perception and it shuts up the internal critic. It also emphasizes that when doing the human figure, the most important thing is what the model is doing not what the model looks like. I was looking through my digital images on my computer and discovered this from my trip to Florida. 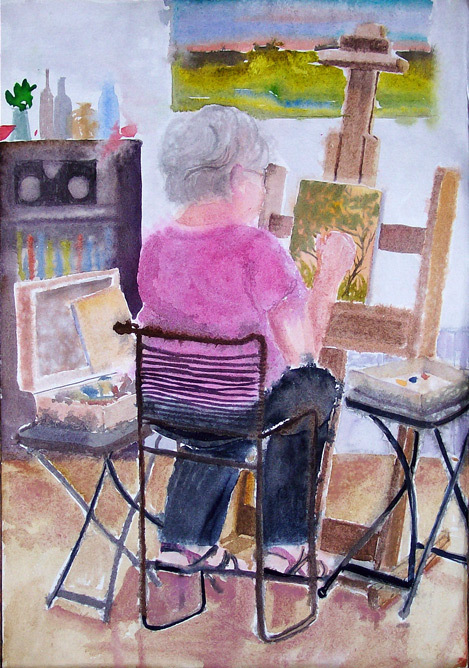 It’s a fellow artist painting in the studio at the local art center. I got a charge out of the fact that her sandals had hot pink trim which matched her t-shirt. Last Monday was the day after hearing of Osama Bin Laden’s death. No one in my life drawing class was anything more than relieved by the news and a little saddened by the memory of the attacks inspired by him. No over-the-top jubilation expressed by us. The seemingly endless violence in the world is something none of us wished to celebrate. Our model, who is a former student of mine, suggested a martial pose. I said I wished we had an ancient Greek or Roman style helmet for that purpose. Then someone said a newspaper hat a la Napoleon might make a suitable substitution. All we needed then were some toy soldiers and toy tanks to acknowledge our sentiments for the occasion. This was done in my living room. My plants are as anxious to go out in some warm weather as I am. Only now is the weather moderating in anticipation of summer. I have canceled my arrangements to build an ark because it has finally stopped raining. I am using some different materials for this drawing. I bought sepia, sanguine, and black fine tipped artists’ markers. Supposedly they are permanent and light fast. It is a little more complicated using 3 different tones for a drawing like this so it takes a little longer to execute. This kind of limited palette is quite out of character for me since I love brilliant color. A change-up once in a while never hurt anyone. I think it stimulates some creative juices and exercises some artistic muscles. This is another drawing done at the Lyric Opera of Chicago from the lower upper balcony. 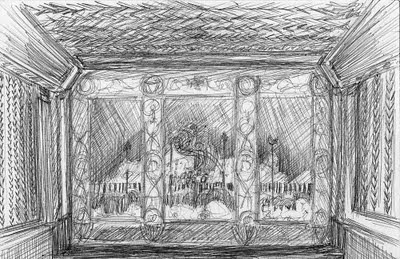 The previous drawing was of the under curtain. This is the fire curtain. I think the proportions are more accurate than my first attempt. It also reflects my high position in the balcony. The place is rich with art deco pattern so for a pattern freak like me it’s a delight. 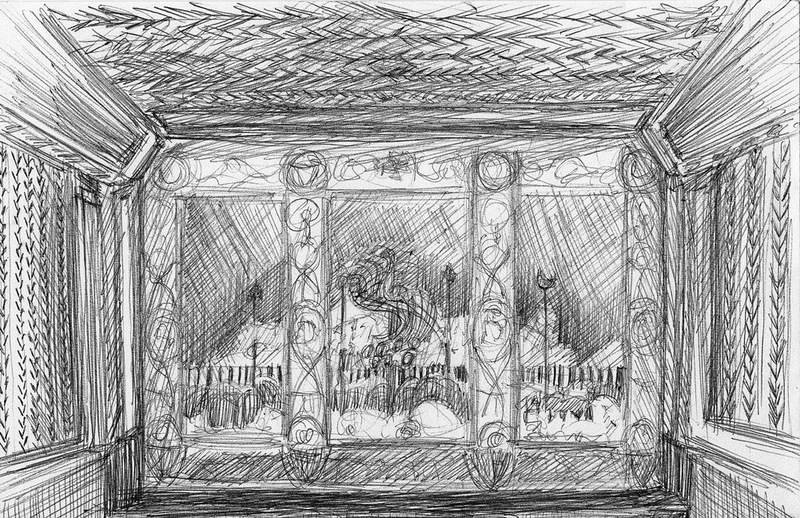 This is a second drawing from the hall in front of the sculpture garden. It’s a much better rendition of the model’s head and shoulders. He has a marvelous bone structure which makes him fascinating to draw. I find there is always something that makes someone interesting to draw. It’s just the richness of human variety.